New research from OranjeCasino.com identifies trends on how consumers value time and money. Reprinted with permission. Read the entire report here. If you had to put a price tag on a second, an hour, or a week of your time, your first thought might be to use your hourly wage to make the calculation. But the value you put on your free time might also depend on the type of person you are and what you’re expected to do for the money. It’s actually much more complicated than simply saying “time is money”. 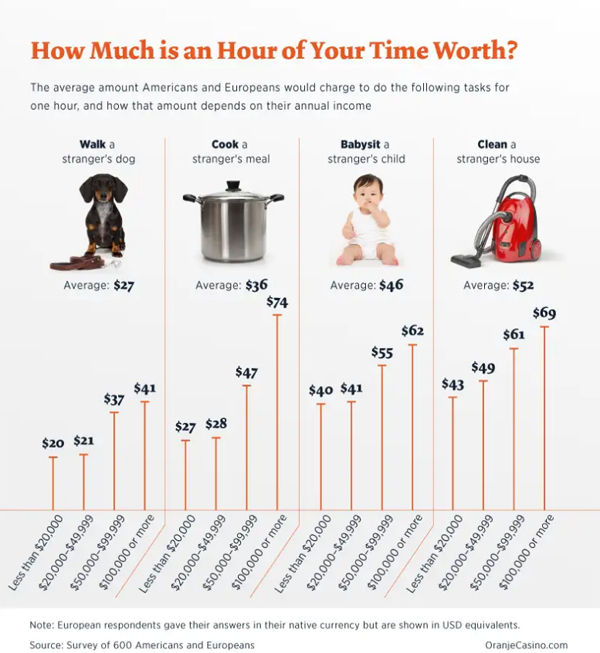 We studied how the value we put on our time differs from our earning potential by asking 600 Europeans and Americans to put a price tag on moments of their free time, each with a different time length and context. 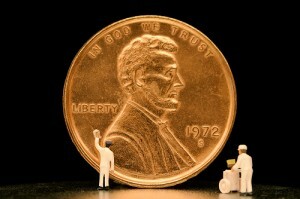 As the adage goes: See a penny, pick it up, all day long you’ll have good luck. However, it seems as though all the good luck in the world isn’t enough to entice most people to spend two seconds of their time becoming one penny richer. Just 1 in 5 Americans said they would pick up one cent off the street. This is even though, according to the US Bureau of Labor Statistics, the median hourly wage in the U.S. works out to roughly one cent per two seconds at work. We also found that only half of Americans said they would pick up a dime, while 3 in 5 would stop for a quarter. Other respondents were more willing to claim that penny, with nearly half of Europeans picking up a cent and 1 in 3 Brits pocketing 1 penny. When we compared the smallest amount of money people said they’d stop for two seconds to pick up on a public street with how much money they said they’d earn at work in the same time, we found that 89% of respondents would not stop to pick up the same amount of money they could earn in two seconds. It seems, therefore, that small change is just no big deal. But if a second isn’t worth a penny to many, then how do they value half an hour of their time? In Britain, “serial returners” send back 7 billion pounds worth of purchases each year, leading to a 20% increase in returns in high street and online stores across the last two years. In the U.S., 10% of merchandise gets returned, worth $351 billion. Even though it’s not that taxing to drop by a store to return a purchase during your next shopping trip, or to make use of the free return policies some online retailers have, some of our survey takers still decided low-value refunds weren’t worth their time. While the average baby boomer was happy to spend half an hour of his or her time returning an item worth $5.33, the average Gen Xer expected more than double ($11.62) if they were to make an effort to send a purchase back to the store. Shopping-savvy Gen Zers required nearly three times the amount as baby boomers, with the average Gen Zer needing the order to be worth $14.29 to sacrifice those spare 30 minutes. We asked respondents how much they would charge to give up an hour of their free time to complete different tasks for a stranger. While the average person was happy to charge $27 to walk a stranger’s dog, they wanted nearly double that to don rubber gloves and clean someone’s home. At just shy of $52, our respondents were hypothetically charging almost five times the average hourly wage of a housekeeper ($10.99 according to BLS) to give up their spare time to get scrubbing. Income affected the requested rate of pay, with respondents who earned over $100,000 a year wanting over six times a maid/housekeeper’s average rate. Surprisingly though, even those on less than $20,000 a year still said they would need nearly four times the average cleaning worker’s wage in return for an hour of their free time. Gender also accounted for differences in the rates our survey takers required for certain chores. Although men and women agreed on the cost of cleaning, the biggest difference was seen when they were asked how much they would charge for an hour of babysitting. We found that women, on average, asked for $38.60, while men demanded a lot more at $54 – over five times the average childcare worker’s wage ($10.72 according to BLS). A survey that measured how satisfied holidaymakers felt with their vacation found that the ideal vacation length was eight days. Europeans could, therefore, enjoy two ideal breaks away with days to spare, as many EU countries mandate at least 20 working days off a year. The average American, however, gets half as many vacation days, and almost 1 in 4 Americans get no paid vacation at all. Despite this, most American respondents weren’t willing to spend more than Europeans to receive an additional five vacation days a year. The only exception was among employees who worked less than 25 hours a week, with Americans willing to pay $42 more, on average, than their European counterparts. The amount Europeans were willing to spend doubled between respondents who worked less than 25 hours per week ($58) and those who worked 26 to 40 hours per week ($116) and further increased by more than half for those who worked over 40 hours per week ($194). Interestingly, hours worked per week had no such effect on American workers, who were only willing to pay $100 regardless of whether they worked 20 hours or 40 or more hours, suggesting that Americans have a more lax approach to taking time off work. Now we have a good understanding of how much people need to be paid to do certain tasks, let’s explore the most productive – and most despised – ways people spend the free time they do get. Men and women seem to disagree on the most valuable way to spend their free time. Women (33%) were more likely than men (19%) to say that socializing with loved ones was the most valuable use of their time. Despite this, the women we surveyed (37%) weren’t more likely than the men (35%) to say they regularly spend their free time socializing with loved ones. A gender divide was further seen when it came to valuing learning a skill, with 15% of women and 24% of men saying this was the best way to spend their spare hours. Our findings revealed there was also a generational difference in attitudes towards acquiring a new skill, with nearly three times as many Gen Zers (29%) than baby boomers (10%) saying this was the best use of their time. Cleaning was the aspect of life that people would most like to pay someone else to do for them – 42% of women and 37% of men said as much. Cooking was the next most unpopular task on average, with women (20%) again slightly more likely than men (17%) to show a distaste for it. But men were more likely to pass the buck on DIY than cooking. DIY and gardening showed the greatest gender divide out of all the tasks our respondents considered, with 21% of men and only 12% of women choosing it as the task they’d most like to pay other people to do. Men also showed a greater dislike for administrative tasks (6% of men compared to 2% of women), while women (8%) were more likely than men (2%) to say they’d want someone else to deal with their beauty regime. Gender wasn’t the only divide among our survey respondents. There were also interesting differences between age groups in what aspect of life they most wanted to pay other people to do. For example, cleaning was most unpopular amongst baby boomers, with 51% wanting to hire cleaning help compared to 35% of millennials and 39% of Gen Zers. Perhaps due to the rise of selfie culture, younger Gen Zers were more likely than any other age group to say they wanted help with their beauty regime, with 11% wanting to pay someone to deal with their hair and makeup compared to 5% of millennials and virtually no baby boomers. Maybe all that time spent on beauty is affecting certain life skills, like cooking, as 21% of Gen Zers and 19% of millennials reported they would like to pay someone to rustle up their meals, compared to just 9% of baby boomers. It’s no wonder that a quarter of young adults admit not being able to boil an egg. . Most people say that having more personal time, free from any commitments or obligations, makes them happier than having more money. But is there a certain number of spare minutes people should be aiming for? We found that most people said they’re happy with how much free time they have, as long as they get at least an hour each day. Over half of people who got less than an hour a day to themselves said they were unhappy with how much free time they possessed, and 11% said they were “very unhappy”. The chances of people describing themselves as happy with the daily amount of free time they get increased steadily with each extra hour of free time. Just under half of our respondents with five or more hours to themselves a day said they were “very happy” with their amount of free time, while a further 41% said they were “somewhat happy”. It’s possible that people’s happiness with their amount of free time is not just dependent on how much time they get, but also what time of day they get it. To explore this, we asked people when they typically get home from work and found that people who were unhappy with how much free time they have typically get home from work later in the evening. The most common time to arrive home among people happy with their amount of free time was 5 p.m., with unhappy respondents generally returning home at 6 p.m. or later. In fact, people reporting unhappiness with the amount of free time they had were almost twice as likely to get home from work at 6 p.m. or later (41% of people unhappy with their free time versus 22% of people happy with their free time came home from work at 6 p.m. or later). We found that when asked to give up money they already had for extra free time, people were prepared to give up less than the US average hourly wage. In contrast, when asked to give up their free time in return for more money, people were likely to charge considerably more than the average wage for their time. This suggests that we really do value the time we get to ourselves – even if it’s just an hour a day – and it’ll take far more than the average earning for us to part with those precious minutes. We surveyed 600 Europeans (48% of respondents) and Americans (52%) on the value of their free time by asking them to put a monetary value or cost to various everyday contexts, with each context involving different activities, obligations, and time lengths. The age of our respondents ranged from 18 to 76 (with a median 33 years old). Fifty-six percent of respondents were male, and 43% were female. Respondents that failed an attention-check question or responded inconsistently were excluded from our analysis. European and British respondents were asked to give monetary values in their native currencies, which were converted to U.S. dollars to help compare nationalities. If you’d like to share any of the results presented here for noncommercial purposes, please include a link to this page so that the OranjeCasino.com research team can get credit for their findings, and readers can check out our results in detail. « Will the Cadillac Tax Generate Revenue?